Top 5 Android Phones – Be Mobile with BMOB.com! Google’s release of the Android open source operating system for mobile phones has resulted in phones with previously unimaginable designs and features being released into the market. For mobile phone manufacturers and freelance coders alike, the freedom to play around with the OS has opened up virtually unlimited possibilities through a phone. While some manufacturers have modified the OS to suit their phones, others have gone with the regular build, which allows you to customize the phone in any way you see fit. While all Android phones see the benefits of the OS, there are some that clearly stand out in the crowd and we are now going to look at the best 5 phones in the market today that run the Android OS. Before we begin, there is one thing that you must be clear about. There is no phone that trumps all the others as each one has its strengths, unique features and most importantly pitfalls. What is important to you might not concern the guy next door a lot. 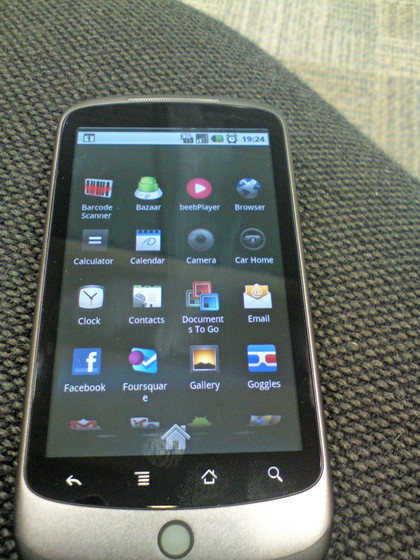 The Nexus One is the first ever Android phone to be released into the market. While it was built by HTC, it is branded solely as a Google phone. The Android OS is very streamlined to begin with and a powerful processor makes the working of the Nexus One rather smooth. Couple that with a great capacitive multi-touch screen and you have a winner. The build quality is great with a metallic finish and despite all the power and features packed into it; the Nexus One is rather light and slim. This phone might have made it to this list but calling it the best or the ideal phone for anyone would be overkill. It needs several aspects ironed out. For example, and we cannot confirm reasons for this but in all probability it is one of the difficulties new and first models face, the touch-screen is not as responsive as Google had publicized it to be. Moreover, the accelerometer is not very responsive. You might need to shake it around a couple of times to turn the screen on its side. In addition, the media player is rather mundane and doesn’t add any appeal to the phone. Despite all the shortcomings, the Nexus One is a great performer. Firmware and OS updates seem to have fixed a lot of the problems and if you are one who is looking for a phone that gives you the freedom to play around, even for an Android based one, the Nexus One should be something you ought to consider. Another great benefit for Nexus One owners is the fact that Android updates always come first to this device rather than any other carrier branded Android phone. 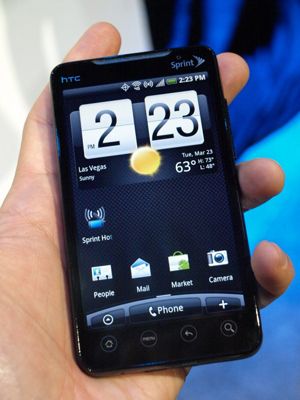 Droid Incredible by HTC features the Sense, a modified UI based on the Android 2.1 OS. The Droid Incredible is practically the Nexus One apart from the UI and a couple of other minor modifications. It is powered by a high performance 1GHz Snapdragon processor, which literally breathes fire. There is hardly any lag in the processing and the interface is extremely smooth. Club that with an 8GB internal storage with an expansion slot and 748MB of ROM, the Droid Incredible really is incredible in terms of performance. Moreover, the hardware of the Droid Incredible is top notch too. The camera is well designed and can capture decent images for a mobile phone but the option of capturing pictures using the screen instead of just the track pad might have definitely been an improvement. Buttons on the phone are well laid out and the AMOLED capacitive touch with 480×800 resolution makes for bright viewing apart from its poor visibility in daylight. The touch screen issues and the unresponsive accelerometer of the Nexus One have been modified in the Incredible. When it was first released, there may have been a lacking of applications on the Android market but now there is a plethora of choices. If you are looking for a high performance smartphone with very few glitches, then this is the choice for you but the UI is something you will have to put up with. Despite all the flair, you might find it a little cumbersome to deal with. Going through several menus, sometimes even for the simplest of tasks, never did much good to anyone. The Motorola Droid is unique in its possession of a processor that is not only clocked low but also under clocked. While the base speed is 600MHz, it is clocked at 550MHz to reduce heat dissipation and increase battery life. Hardware and performance wise the Droid might seem low end but once you use it, it is anything but that. The display sported by the Droid is simply amazing and is crisp even in daylight. Moreover, the base OS, the Android 2.0 features a web browser that is blinding fast. In addition, the Droid is extremely customizable. Now, you might think that is the cornerstone of an open source OS but the HTC phones, with the modified UI leave little room for customization but the Droid doesn’t restrict you at all. In fact, it can be pretty overwhelming at times and you might be lost for choice. 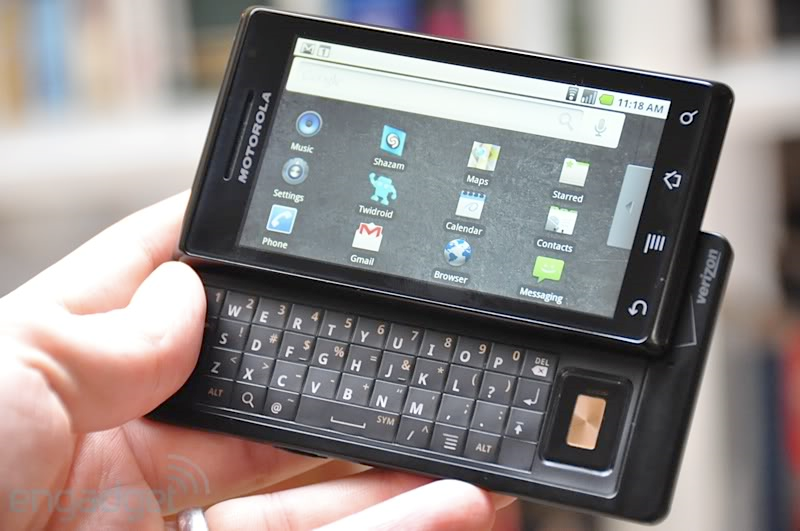 The Droid features a full QWERTY keyboard that slides out on the side. While this is functional, Motorola might have won more hearts had it been laid out better and designed with better and smoother ergonomics. Although it features a good camera, the interfacing is below average and video functions trail behind other similar phones. This phone is ideal because of the freedom it gives you to manage every aspect of it and despite the low power processor, it delivers enough to the average user. For those of you who have a penchant for believing their phone to be a conventional computer, this is something that you might want to avoid. Everything about the Droid X, starting with the name is futuristic. Enhanced multimedia features including modified audio and video playback ensure seamless listening and viewing. 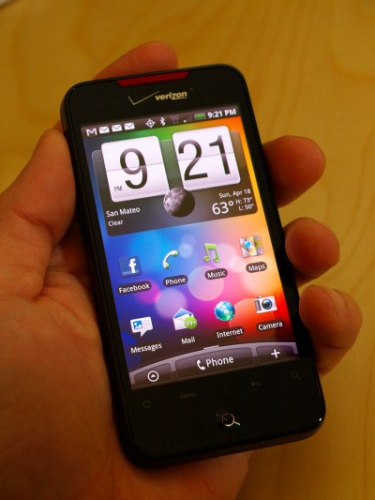 With the release of the HTC models, especially the Incredible and the Evo 4G, Motorola re-entered the market with the Droid X and what do you know? It worked well for them! The HDMI output is fairly unique and you could turn this phone into a HD video player. 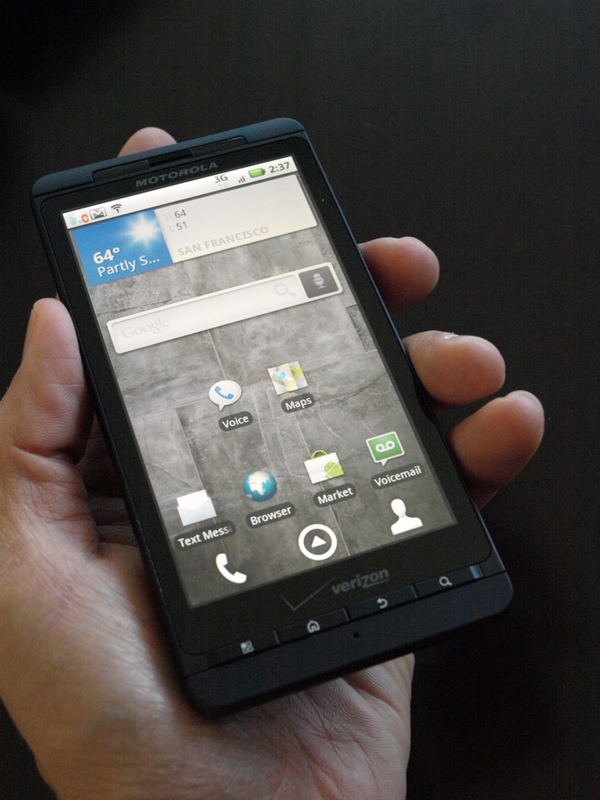 The Droid X seems more like a multimedia phone than a professional or executive phone. For those of you looking for performance that is more entertainment oriented, this is the choice. The camera is beefed up to a good 8 megapixels, which is a large number to show but the image quality is still average. In addition, you might find that capturing images is not that great an experience thanks to the sluggish interface, which is limited not just to the camera. The HTC Sense UI trumps the Motorola Droid’s interface on all aspects and this is probably why you would find more people with an HTC than a Droid X. It might seem pointless to a lot of people but the Droid has it; it can be a hotspot and broadcast 3G network over WiFi. We don’t see any practical use of this and we hope you’d let us know if you did! What would catch anyone’s attention when they first look at the Evo is its sheer size. The screen is a whopping 4.3” and it might be the same as several other Android phones but the layout of the phone and its sleek design make the screen more prominent. Unlike some other Android phones the Evo uses an LCD screen and its contrast and brightness are no different from AMOLED screens so don’t be fooled by manufacturers selling AMOLED phones at a much higher price tag. In fact, the Evo 4G has much better daylight readability than the AMOLED Nexus One. The 8MP camera with 720p video recording was considerably important in bringing the Evo 4G onto this list but note that images, though with a bit more noise reduction and sharpness than required, could still be improved. The video claims to be 720p but when viewed on a computer, compression significantly distorts the quality. Don’t consider the Evo as a replacement for your video camera. The UI is the same as in other HTC Android phones, a modified one called the Sense UI and it is unbelievable smooth. The phone hardly ever hangs thanks to the 1GHz processor that blows off as much steam as a cheap laptop. Coming down to the most important aspect of the phone; the connectivity. Yes, it is 4G compatible but it will take years for you to experience that high speed internet in all cities as only a select few have 4G networks running on them. There is no doubt that the HTC Evo is a powerful smartphone and definitely ranks high in this elite list but if you have never used an Android phone before, best accustom yourself if you a plan of buying this. Moreover, voice quality on this phone is not what a device like this ought to have. There are occasional distortions but like most owners, you might want to overlook that. We’ve said this before and we want to say it again. Look closely at each feature of every phone before making your decision. Perhaps imaging and multimedia aren’t that important to you and maybe integrated email is. Choose the phone based on your priorities and not merely on the best features that something has and another might not.